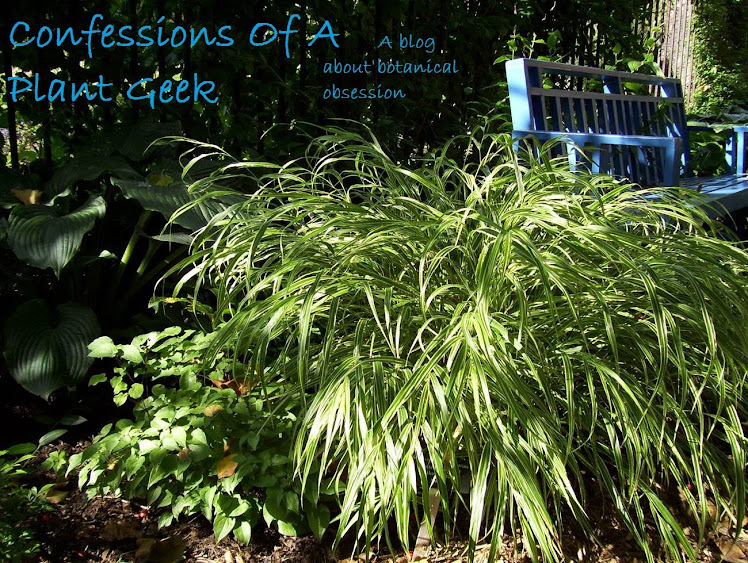 Confessions Of A Plant Geek: My Summer Project: Part 1. Each year it seems I get busier and busier and have more and more projects. Much of it is of course self-inflicted, but it leaves me with less time to do things like blogging. Last year's big project was ripping out the gardens and working on the house to get it ready for sale. For a few reasons we decided to pull the house off of the market, refinance, and stay put for the time being. This led to a project for this year; putting gardens back in. Since we're staying put and we both hate cutting grass, I've decided to minimize that chore and remove large sections of lawn. Part 1 covers the biggest section I've removed so far, the east driveway garden. Most of this was done over a period of 3 days. I started out by spraying the area with roundup for a complete kill. The next weekI brought in 10 cubic yards of compost and did a rough spreading to the areas I didn't want to remove any sod.. Since my lawn was higher than the sidewalk, I also rented a sod cutter to remove sod from the edge along the driveway and sidewalk and then finished spreading the compost. Once the area was graded how I wanted it, I started placing plants. I also had to go dig up some plants from their temporary location that had been in the old garden. Once everything was in place I started to plant, and got poured on. Twice. So I had to finish the next day. I also did an application of preen to prevent weed seeds from germinating. I do have some weeding to do along the edges of the driveway and sidewalk. I haven't mulched it yet, and I'm planning to use leaf mulch from my maple trees this fall. That way I can easily do my spring/fall maintenance of cutting plants back with a lawn mower. These plants sat on the driveway much of the summer. In the process of compost spreading. Compost spreading finished. Ready to plant! Plants are placed. Time to plant... ? Or not. The rain had other ideas. Part 2 will cover where I actually started with the yard, the north side of the house. Part 3 will cover a different business-related project that caused some issues this year. Look very promising...I can't wait to see it next year at this time...it's going to be amazing!